"There was a problem loading the dashboard data may be outdated. If the problem persists please log out” error. I have been a Webcore user for a few years. I recently switched from an android to iphone and wanted to update my pistons that have a presence dependency to my new phone and I cant get in to the dashboard. This is the screen I get stuck on… It says \ loading… in the top left forever. Here are the logs for WebCore. I installed the debugging code suggested above. Approximately how many devices are on your ST account? Approximately how many devices are associated with webCoRE? Can you remove devices from webCoRE that are not used in your pistons via the webCoRE smart app or does the app also produce errors? Did you add or remove any devices around the time this problem began? Have you noticed any specific devices not working, missing, or otherwise acting up in SmartThings? Earlier tests showed that the webCoRE Storage app that loads devices was itself not loading apparently due to a timeout retrieving devices. There may be additional debugging to attempt in webCoRE code to better identify the problem but at this point let’s start with the above questions. There is not enough feedback yet to conclude that the number of devices is the sole root of this problem. However, while reducing the number of devices is the only action found to improve the situation there is no set threshold that works for everyone; @jasonrwise77 was still having issues with as few as 80 devices per instance. I have not encountered the problem and don’t have nearly enough devices to push my luck. Just thought I’d share my workaround in case it helps others. Step 1: Create several new instances of WebCore – in my case, I created 2 new instances above and beyond my initial instance. Step 2: Come up with a partitioning plan on how to divide up your pistons/devices between the multiple instances. In my case, I decided to put all devices on the 2nd and 3rd floor in one instance of WebCoRE, and all my devices on the 1st floor and outside in another. I then used my original instance as a “Master” to control the other two. The master handles things like Arrival/Departure routines, Sunrise/Sunset pistons, etc. and then calls pistons in the other instances to execute against devices not in the “Master”. Step 3: Start removing devices from the Master until you can get the dashboard to load. It took me removing almost 100 devices before I could get it to load. Note, your piston will still run fine without the devices being available to WebCoRE, but you won’t be able to edit them until you move them to one of the other instances. Step 4: Add the appropriate devices to your other instances. Step 5: Go to the new instance, create a new piston, choose “Duplicate” and select the piston you created previously in the original instance and duplicate it in the new. You will likely have to edit the devices but all your logic will be there and not have to be recreated. Whew! I did this for well over 80 pistons, it took a while, but I’m back up and running now with this workaround. There is not enough feedback yet to conclude that the number of devices is the sole root of this problem. In fact, I would say it seems to be related to server load, as even with my workaround, sometimes I’ll get one instance of the dashboard that won’t load…then come back an hour later, and it loads fine. About 200. It has been this many for many months. All are and always have been associated with webCoRE. I can remove devices via the webCoRE SmartApp without a problem. I am having general ST issues since the hub 24.11 FW update the other week. I have instability in my Zigbee sensors. I had a few Z-Wave devices go unavailable but they all seem back for now. I do have the issue where I cannot get my device list to show under the Things tab in the ST mobile app (bu they load just fine when viewing via Rooms). Despite all that the WC dashboard was okay until I reported in my thread the other day and I had not added any new devices when it went pear-shaped. Nothing out of the ordinary ST instability. Its actually been better than normal for several weeks. I can remove or add, but have already removed all unused devices. To be honest I have no idea, was well over a month ago. yes, a 2 door locks, 1 leak and 1 contact, but those do not see to be affecting the pistons, they are all working at the moment. @ipaterson I can confirm that the # of devices does not matter when discussing this. I created an instance with 2 pistons and 10 devices and it still gave the same error. Per my other thread, I’m having this exact issue. Here are my answers. UPDATE: Ok, weird. I can now add my instance. I didn’t change anything. 315-330, I can’t access the webCoRE instance so I had to count in the mobile app. I can only remove 6 that are not being used. I removed them, no change. I have been adding a lot of devices. I added about 10 zigbee motion/contact sensors and about 8 z-wave switches/dimmers. I have about 20-30 more devices to add. YES! - Since adding the 18 devices noted above, I started experiencing a lot of issues with webCoRE triggering correctly and saying it sent the command to the device but the device not responding. Then a few minutes later I would trigger the same piston/automation and it would work. I tried repairing both the z-wave and zigbee meshes. I can’t say that it improved any. I have about 10 webCoRE instances. I have been having lots of performance issues with webCoRE. I suspected due to the number of devices I have. Some instances have always been split out due to wanting to separate security, leak, fire automatons so I don’t break them on accident. I’ve also split out my notifications handling as I have been working on something similar to you for custom/intelligent messaging. I have a “Presence” instance that handles my more complicated presence logic that doesn’t need to be in my main instance. My main instance handles 80% of all of my automatons. It would not be easy to split out. I can say that I have likely only added a few pistons to that main instance (which is the one I cannot access). Lots of good info here, thanks to everyone for sharing your experiences. @whoismoses, since you have expressed interest in contributing code to webCoRE is this something you would like to try debugging? From earlier tests in this thread this exception was being thrown from the SmartThings black box when attempting to communicate with the webCoRE Storage smart app. The webCoRE Storage smart app was not running at all. The call to the storage app is in webcore.groovy’s listAvailableDevices around line 1699. 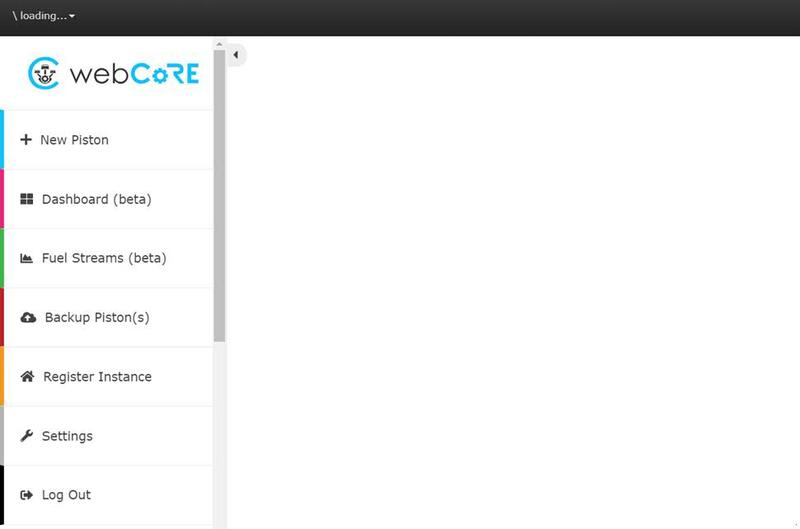 You can see the "dev:" settings that the code is referencing at My Locations > smartapps > webCoRE (dev) > webCoRE (dev). You should have one storage child app for each of your webCoRE instances. I had considered seeing what happens if the devices are stored on webCoRE rather than the storage app (this is the default if there is no storage app installed) but I suspect that if this is indeed related to the number of devices or device attributes (and current ST platform performance) it would just cause the webCoRE app itself to not load. I haven’t been able to think of anything more to try on our end since it seems firmly dependent on platform performance at SmartThings and have no way to test it myself since my account has been unaffected. Also just to confirm, your 9 other instances still work, and have fewer devices? I did deselect the devices from webCoRE but still nothing. Hadn’t added any devices for a while and the last time I did, I didn’t have any issues logging into webCoRE. Any news on this folks? I have not been able to create, maintain pause or resume anything for some time due to no dashboard access. webCoRE is basically useless to me at the moment beyond pistons that are already running. I needed to pause a piston today and couldn’t. And I need to make some changes for the holiday period. Can’t. I am also eagerly awaiting some resolution. If there is no fix in site is there a workaround? How do I update my pistons? Am I correct to assume that everyone affected by this has brought up the complaint to SmartThings support? I have personally called them asking them how to remove an old location thinking that was the cause of my problems with WebCore. That was fixed and this problem still persists. When I told them the real issue is a problem with WebCore they politely redirect me to this team. I asked above what should I be asking SmartThings Support to fix and I did not get a response? My smartthings is working fine, only my access to pistons is not working. I asked above what should I be asking SmartThings Support to fix and I did not get a response? The problem to report is that you are experiencing timeouts in smart apps that retrieve your list of devices, which ST support should be able to see according to Jarrett’s support experience. It would be great to hear what others have experienced when contacting support for this. Otherwise there is nothing that we can do. I guess I missed previously why I needed to. I thought this was a webCoRE problem. So now I get it. And that would indeed then relate to the issue I have where my Things list will not load in the ST Classic app. I have already reported this to ST Support, been told they know about it, followed-up and been told no fix in sight. Awesome. I have already reported this to ST Support, been told they know about it, followed-up and been told no fix in site. Awesome. Yeah unfortunately we are at a very disadvantaged position for a fix on this since ST is probably laser focused on the new platform and API. I added a new device and now my Things list (in ST Classic) seems to be populating fine again. The Favorites loading on the Dashboard is still hit or miss. So, it seems whatever was causing my list of Things not to load has been ‘fixed’ by the addition of a new device. I’m wondering if some existing device was tripping-up the device loading process and now the order of devices has changed with the addition of the new device the problem somehow goes away. I’m going to give Support the same info. Note, my webCoRE dashboard is still not loading. It was thought these issues were related. UPDATE: Adding the new device to webCoRE has resolved the webCoRE dashboard loading issue too. That’s good to hear! Others have tried the same with no success I believe but in case anything has changed in ST would anyone else like to try adding a new device? Others have tried the same with no success I believe but in case anything has changed in ST would anyone else like to try adding a new device? Yeah, there has to be some kind of DB instability with large device lists in general. I’m not sure anything is actually fixed on ST’s end (no response from Support) - I may just have gotten lucky. My Things list/dashboard loading issues just seemed to start out of the blue - not after I had just added a device.